Relationships (familial, legal, and etc.) that have been added to an individual record may change over time. When they change, update AgencyBloc to make sure you always have the most current information at your fingertips. In this article, learn how to change relationship categories, merge relationship categories, and turn basic individuals into individual records. Note: If the relationships in your account appear to be flip-flopped, see the Switch a relationship section in this article to learn how these can be fixed. Basic individuals track a limited amount of information, and they are not included in AgencyBloc’s Automated Workflow, Email Marketing, activity, or reporting features. 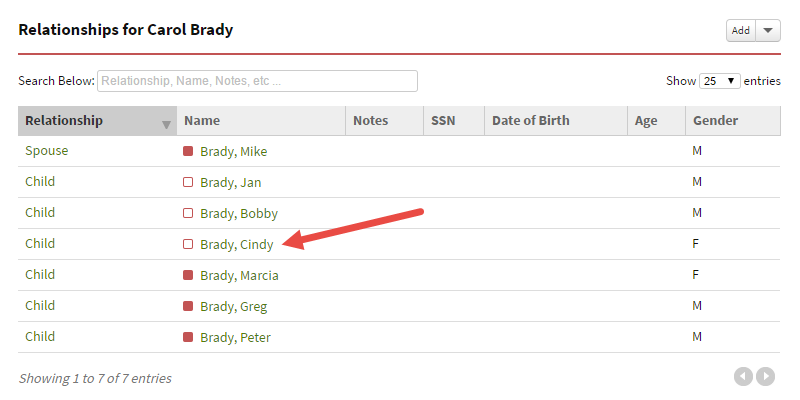 If you want to add more information and include basic individuals in those features, you will need to turn basic individuals into individual records. Go to an individual record and open the Relationships tab. Select the basic individual from the Relationships tab or Individual Summary. Basic individuals can be distinguished from full individuals by an empty square icon . Select 'Save as Individual Record'. The basic individual will become an individual record in your account. All details and notes that were added to the basic individual will transfer to the individual record. Users with Manage Data permissions can add/edit relationships in Data & Custom Fields. On the Data & Custom Fields > Field Options > Relationship tab, you will see a list of all relationship field options in your account. This tab controls which relationship field options appear in dropdown menus when you add individual relationships to basic individuals and individual records. The “Category” column shows the category that a relationship field option is associated with. Relationship field options are associated to one of four categories. Use categories to group similar relationship field options together and stay organized. Personal - such as spouse, significant other, domestic partner, etc. Family - such as parent, child, sibling, relative. Legal - such as power of attorney, trustee, legal guardian. Other - by default, any relationships previously created. Go to Profile & Settings > Settings > Data & Custom Fields. Select ‘Relationship’ from the dropdown menu on the Field Options tab. Select ‘Add’ next to the dropdown menu. If you open the dropdown menu and select the ‘Add Standard Relationships’ option, you will re-add standard relationships that had previously been removed. Standard relationships are a set of default relationships specific to the health and life insurance industry. Fill in details for the new relationship and mark the ‘Active’ checkbox and save the changes. Inactive relationships do not appear in dropdown menus. To merge relationships, users need Manage Data and Manage Custom Fields permissions. 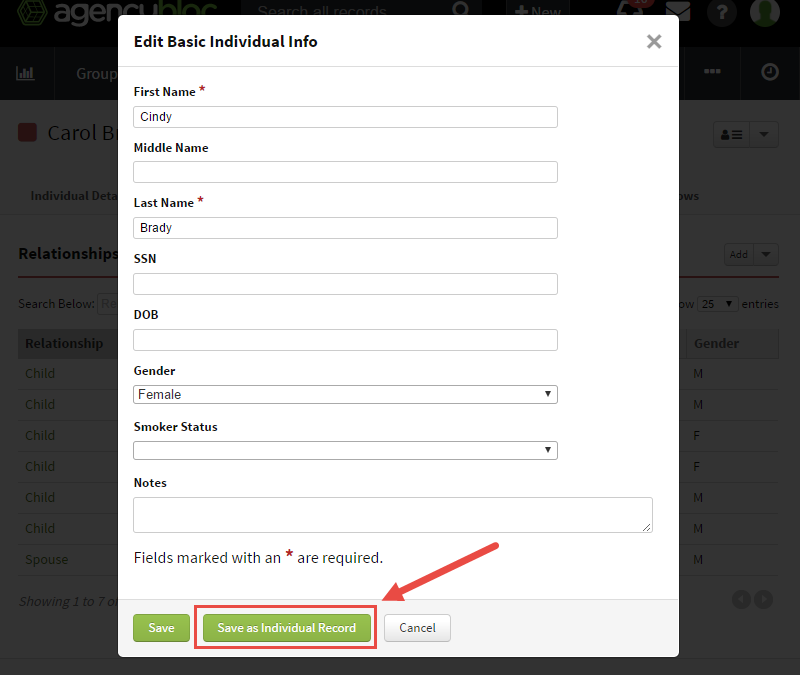 To help manage relationship field options, you can merge all records of one relationship field option into another. This may be helpful if you’re using gendered relationship field options (Husband/Wife or Son/Daughter), and you want to change them to something more generic (Spouse/Child). Before merging, it’s good practice to run a report of your individual relationships and create a backup because merges cannot be undone. Select the ‘Merge Relationships’ option from the Add dropdown menu. Select a relationship and merge into option. Relationship: The relationship category that is merged into the other relationship category. The category in this field is deleted. Change to: The relationship category that is merged into. The category in this field is retained. After merging, the relationship categories on all affected individuals will be updated to reflect the new category. If your individual relationships look backward (see image below), like parent and child are switched, contact our Client Success Team. They can help you switch or flip the relationships in your account. In this image, it might look like Carol Brady is the child of Marcia Brady, but it is actually the opposite. Note: In order to switch relationships, gendered relationships need to be merged into a general relationship before switching can occur. For example, first merge son into child and then we can switch parent and child. Can I undo merging a relationship? Merges cannot be undone. So before you merge, make sure you do a quick review to double check everything.